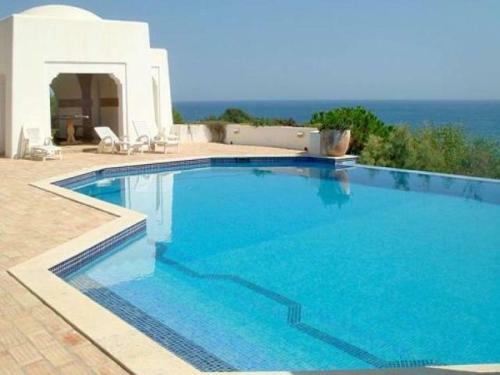 Located 2 km from Sesmarias, between Albufeira and Armação de Pêra, Villa Coelho offers an outdoor pool. The property is an 8-minute drive from the idyllic beaches of the area. Villa Coelho includes 1 twin bedroom and 2 double bedrooms. Located in Sesmarias, between Albufeira and Armação de Pêra, Villa Serafim offers an outdoor pool. This self-catering accommodation features WiFi. The property is 1 km away from the nearest beach. The T1 Point 2 is a refurbished one-bedroom apartment located in Albufeira, located within a 5-minute walk from Peneco and Pescadores Beach. It offers free WiFi access. Bright and airy, the apartment includes a balcony with a table and chairs. Situated in Albufeira, this villa features a terrace and a garden with a seasonal outdoor pool. The villa is 500 metres from Albufeira Marina. Free WiFi is offered throughout the property. The kitchen has a dishwasher and an oven. Akisol Albufeira Sunny Apartments are located in Olhos de Água. A 10-minute walk from Maria Luisa Beach. All Apartments have access to an outdoor swimming pool and a private garden.